Junior Team leader : « Pathophysiology of neuron-oligodendrocyte interactions » Institut des Maladies Neurodégénératives, CNRS – UMR 5293, Bordeaux, France. Myelin sheaths, the fatty cellular processes produced by oligodendrocytes, electrically isolate axons and provide nutrients to long range projection axons. The formation of myelin is a complex process that requires the interplay of neurons and oligodendrocytes and continues long into adulthood. In humans, this period of myelin formation continues into the 3rd decade of life. There is evidence that in the early stages of axon-oligodendrocyte contact formation, calcium signalling plays a role that can be mediated by neuronal activity. Myelin sheaths are thought to be plastic, changing in thickness or length in response to neuronal activity. However, little is known about the possible signalling pathways. In our recently published work, we addressed whether oligodendrocytes that already formed myelin, exhibit calcium changes in their processes. Additionally, we tackled the role of neuronal activity on myelin calcium changes. Using calcium imaging with high temporal resolution in combination with electrophysiology we identified a period of dynamic calcium signalling during myelin formation. Frequency of calcium events decreased with maturation of mice, but could be reactivated in a pathological multiple sclerosis model recapitulating developmental myelin formation. Neuronal activity was excluded to be involved in the generation of calcium changes in myelin sheaths. In contrast, mitochondrial calcium release was identified as calcium source. In summary, these data identified a role of cell autonomous mitochondrial generated calcium signals during periods in which oligodendrocytes have increased levels of metabolism, transcriptional regulation and cytoskeleton rearrangements. 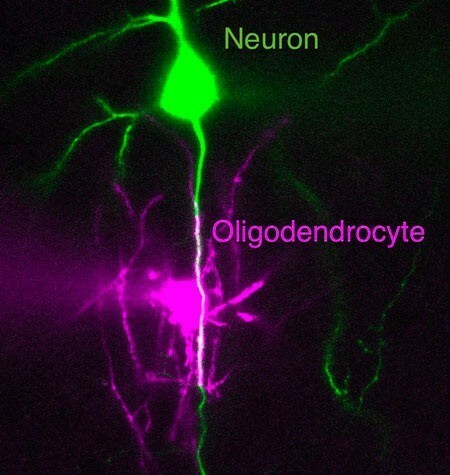 Figure: Neocortical layer 5 neuron (green) with an oligodendrocyte (magenta) that wraps the axon of the neuron. Myelin starts after the unmyelinated axon initial segment. This cellular arrangement was used to determine the effect of action potentials from identified axon myelin assemblies on oligodendrocyte calcium dynamics. From 2007 to 2011 PhD studies in Neurosciences (Charité Berlin, Germany) working on role of phospholipid mediated modulation of synaptic communication. 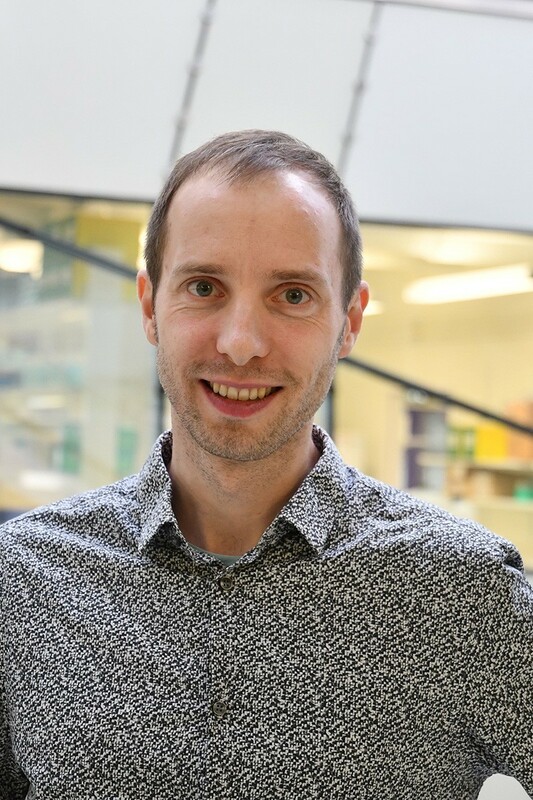 Post doc from 2011 to 2018 at the Netherlands Institute for Neuroscience in Amsterdam in the group of Maarten Kole. Junior Team leader at the IMN since Fall 2018 addressing research questions in the (patho)physiological interplay of neurons and glia especially at the axon.